Three women who claimed to have seen the Virgin Mary in the night sky 34 years ago still insist they witnessed the apparition. In a new RTE documentary, Patricia Bowen, the secretary of the Ballinspittle moving statue committee, also contends the statue still moves to this day. 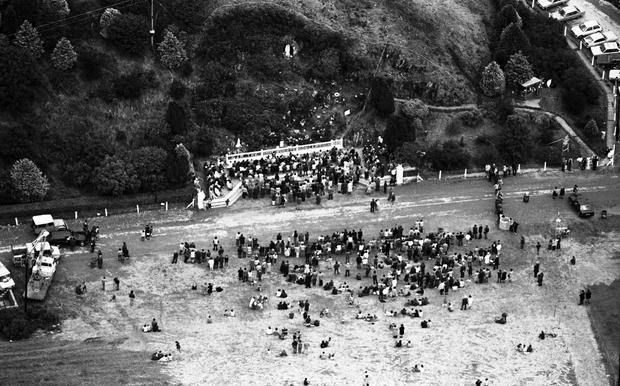 In 1985, Ireland was gripped by a moving statues phenomenon from Ballinspittle to Stradbally, with thousands of people gathering at grottos in the belief that they would witness stone statues move. In the same year in Culleens in Co Sligo, four teenage girls reported seeing a floating life-size Virgin Mary. Coleen McGuinness insists in the new RTE documentary that she still has no doubt about what she saw as a schoolgirl. She said: "I know what happened - 100pc, and if I lived till 102, I will always say 'I seen Our Lady on the 2nd of September 1985', and nothing will ever change that." Her sister, Patricia, said they endured years of teasing over their holy vision but she takes it in good humour. She said: "A lot of our friends at school did believe us and would have come up and prayed along with us. "But you had some people who just didn't believe. You would hear things like it was the divil you seen. If we went to a disco the lads would start blessing themselves." Coleen said they were told they must have been on "magic mushrooms" and were called "queer ones" but she said they were innocent when they had the group vision. "You weren't influenced by anything other than what was happened in your little village. "You had Mass on Sunday, the Late Late Show on Saturday night, very simple, easy-going, but very nice." On September 2, 1985, the girls were walking home from the shop. "Mary just held my hand and I looked up into the sky and to the right of me I seen a vision of Our Lady. It was like she was just floating just above the ditch," said Coleen, who went back to the spot on the road with the documentary crew. "She was life-size, she was in brilliant white for me and I could see her face clearly. I did get very scared and I went over as far as Patricia [her sister]." Patricia, who returned to the spot with her sister and cousin for the documentary, confirmed more than three decades on she could also see the face of the Virgin Mary. "You feel you could reach out and touch her. I felt very frightened for a couple of seconds and then the fear just left me and I knew we were going to be OK and I just started praying." Mary said she couldn't see her face as clearly. "I just saw Our Lady with her hands folded in prayer. I couldn't make out her face very clearly and I also had this feeling of complete calm. "And then all of sudden I [felt] like someone put their hand on my head and an electric shock kind of a feeling coming all over my body and I just felt calm after that." Patricia said they were relieved to be believed by their parents who told them to tell their local priest. "We were normal teenagers. We weren't going to come up with something like this, we hadn't heard of anything else going on back in 1985 at that stage. "Our Dad said to go and tell the priest and to go back to the same spot and pray." The summer of the moving statues in 1985 began in the Kerry village of Asdee on Valentine's Day when around 20 children claimed to have seen statues of Jesus Christ and the Virgin Mary moving. This phenomenon was reported across the country and lasted until September that year when the crowds died away and statues stilled. The documentary returns to people who claim to have had sightings in Monasterevin, Sligo, Stradbally, and Ballinspittle. Ballinspittle native Patricia Bowen, secretary of the grotto committee, remembers huge crowds being drawn to west Cork. "The first night I think there might have been about 20 people gathered there, the next night there was a few hundred there, before the end of the week there was a thousand there and it kept growing and growing. "I saw the statue sway from side to side and in and out", she said. "You'd think it was going to fall off the rock, yeah, crazy," another local told the documentary. 'Moving Statues - The Summer of 1985' will be shown on RTE One tomorrow at 9.35pm.